Cranberry Pretzel Bark Recipe | Great DIY Gift Idea! If you are looking for a new holiday cookie recipe to add to your repertoire this holiday season, be sure to check out this recipe for Cranberry Pretzel Bark! This recipe combines the crunchy, salty flavors of pretzels with smooth, sweet chocolate. The cranberries add a nice tartness and a gorgeous shot of color to this delicious dessert. I happen to love cranberries AND chocolate, so this is like heaven to me. Cranberry Pretzel Bark looks amazing on any cookie tray, but it also makes a unique and heartfelt DIY holiday gift! Simply break it up and add it to a mason jar with a pretty bow, a holiday tin, or place it in a holiday themed bag and it is sure to be a hit! The first thing you need to do is break up your pretzels. I tried chopping them up with a chopper and ended up with pretzels all over the floor. I recommend using small pretzel sticks and breaking them in to 2 or 3 pieces by hand. Have a 9" pie pan, 8x8 or 9x9 square pan handy. Using a double boiler, melt 12 oz of white chocolate chips and 2 TBSP of vegetable oil. Stir chocolate and oil mixture until it is smooth. Remove from heat and pour into a medium sized bowl. Add pretzels and cranberries to melted white chocolate and stir gently. (Note: if you do not have a double boiler you can melt your chocolate and oil mixture in the microwave or in a glass measuring cup sitting in a sauce pan filled with enough water to surround the measuring cup but not spill into it). Using a rubber spatula, spread the white chocolate/pretzel/cranberry mixture into the pan and spread evenly. Place the pan in the refrigerator until the chocolate hardens. Melt 6 oz of semi-sweet chocolate and 1 TBSP of vegetable oil in the same way that you melted the white chocolate previously. Stir until the mixture is smooth. Remove semi-sweet chocolate mixture from the heat. Using a fork, drizzle the semi-sweet chocolate mixture over the hardened white chocolate mixture until it is nicely coated. Place the pan back in the refrigerator until the semi-sweet chocolate hardens. 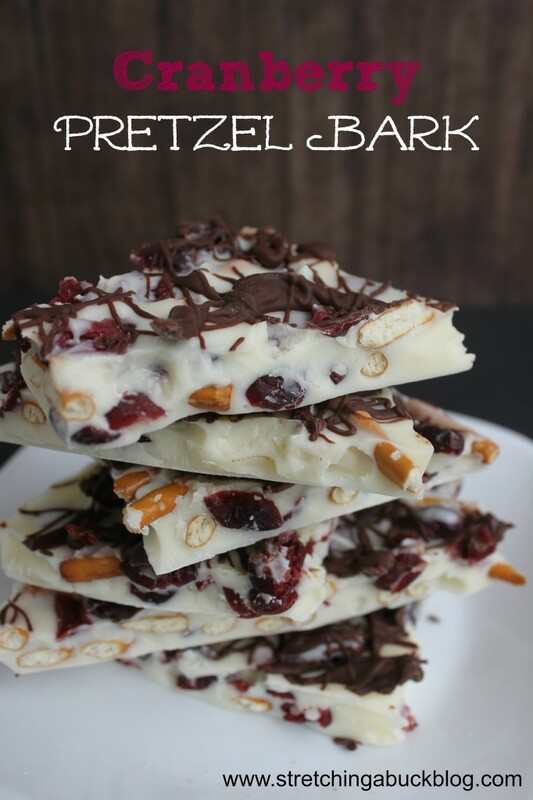 Once the Cranberry Pretzel Bark is completely hardened, you can remove it from the refrigerator and break it up to serve. This would also make a great gift packaged in a holiday tin, gift bag or mason jar with bow. Enjoy! Find more great Christmas recipes, money savings tips and more here. Thanks for that recipe. Could be adapted to use what ever you have in the pantry.